This is a very easy to prepare lemonade with a simple electrifying twist. It is very refreshing and thirst quenching. I made this lemonade a lot of times during the holy month of Ramadan. I made this after a very long time to serve for the get together we had at home to celebrate my daughter's second birthday. The theme was Bubble Guppies and I found this lemonade to be most appropriate to go with the theme. Here is how you make it. I am posting the ingredients for 1 serving. 1. In a saucepan add the sugar, water and salt. 2. Bring to a boil and let the sugar dissolve completely. 3. Switch of the flame and let it cool completely. This is a basic sugar syrup. 4. Add the freshly squeezed lemon juice and mix well. 5. Add food color drop by drop and mix well to achieve desired color. 6. Keep this in the fridge to chill. 7. 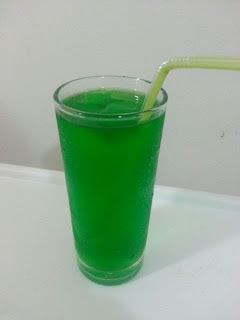 To serve add equal amounts of the coloured syrup and chilled 7up. 8. Serve with ice cubes or lemon slices. You can even add food colour to the water used for freezing the ice cubes.